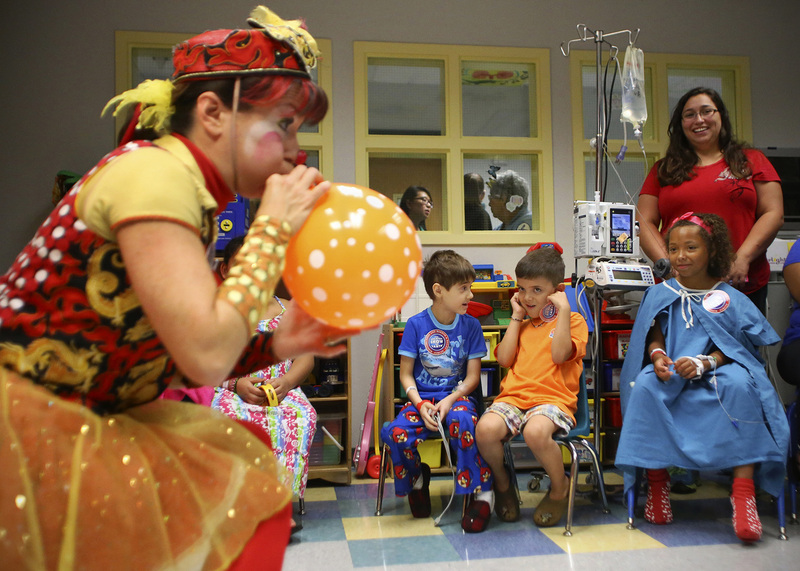 From left, Ringling Bros. and Barnum & Bailey Circus clown Gina “Gigi” Allison blows up a balloon as Daniel Adair, 7, Jake Ryan, 7, and Rubie Frazier, 8, watch on Thursday, June 19, 2014, at Methodist Children’s Hospital in San Antonio. Allison, who has been with Ringling Bros. since 1986, is based on Orlando but travels around the U.S. throughout the year to promote the circus at libraries, YMCA centers and occasionally hospitals. Her goal Thursday was to entertain both hospital patients and their parents, who may not be able to attend a full circus show. “We bring the greatest show on earth to them,” Allison said.